Nita Black is a good friend and business colleague. We have known each other for over 15 years and have worked together in many capacities, leadership, business planning, and business coaching. I feel very confident in her expertise and in talking to her about my finances because I know she respects me and believes in me. The business tools that she has shared have helped me in the many business cycles of business ownership. It’s hard to find people like Nita who are good with numbers but who also really care about their clients and advocate for what is best for them. Nita removes the fear and confusion often associated with learning complex business concepts. Because she knows what bankers want and why, Nita’s “business plan in a day” seminar series is a must-do for anyone starting a business, planning to apply for a loan, or needing strategic business consulting. What Nita Black offers in her business budgeting and planning is razor sharp understanding of human behavior in business terms. Nita brings the human equation back into business. She truly understands how emotions limit our beliefs, how emotions arise in the business world, and how they affect the choices we make. She will help you create a business plan that is attainable, help you define the steps to get you to each of your goals, develop the business budget, and mentor you along the way so you don’t lose focus on your dreams coming true. Nita has truly been a blessing to our business. 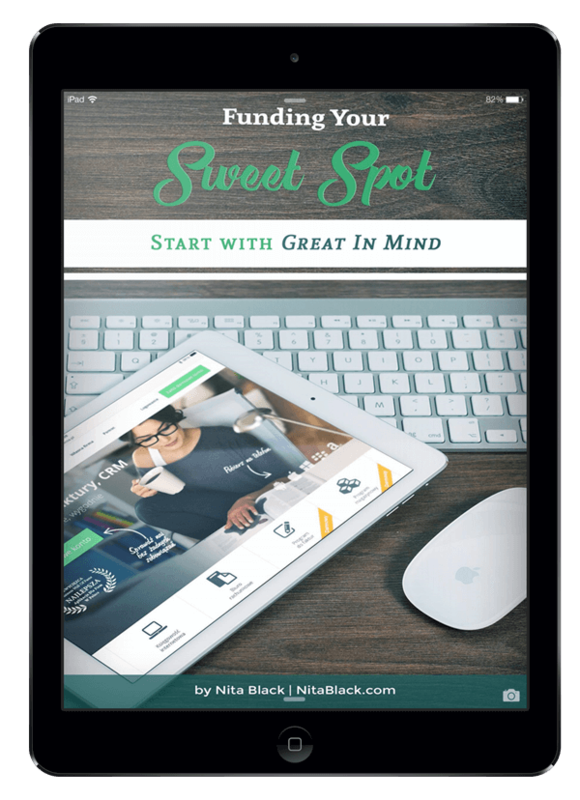 Having been hired to film several entrepreneur meetups, I was able to sit in on and observe Nita’s business savvy and wealth of knowledge, invaluable assets for any small business owner or aspiring entrepreneur. Thanks so much for the insights (& the business), Nita! Nita helped me set clear financial goals for my photography business. She is very understanding of small businesses and her advice helped me set new goals for the coming year. Thank you! I’ve had the pleasure of knowing Nita for many years, in several capacities. I first met Anita at NAWBO (National Assn of Women Business Owners), then she assisted me with building a business plan for my company, then as owner/operator of MO’s Coffeehouse. Nita is professional, creative, dedicated and knowledgeable. If you have the opportunity to work with Nita, do it. You will be grateful always! Nita has been my business advisor for several years. Right from the start she helped me create a business plan that steered my business into an efficient and, ultimately, profitable direction. Whenever challenges arise, even if they are minor, Nita is usually the first person I call to brainstorm through them. I’m so glad to have her as a resource and would happily recommend her. Nita and I worked on a government initiative to strengthen second-stage companies called Economic Gardening. I witnessed her commitment, integrity, and authenticity to strategically reach out to businesses that could benefit from the intelligence gained from teams at the Edward Lowe Foundation. She has a healthy balance of compassion while understanding how to positively impact the bottom line for companies for which she works. Nita is trustworthy and uses her wisdom to influence and encourage others to make informed decisions. This letter is to share how passionate and committed Nita Black is for the homeless and poverty stricken people within her community. Nita’s intelligence, work ethic, positive attitude, teamwork mentality, leadership, and diligence pushed our Non Profit organization to a level of public recognition. Her skill for researching grants and writing which helped to enhance and empower the clients were beyond exceptional. I don’t think she sleeps. Nita has shown me time and again that she is a positive, motivated leader with amazing potential to serve our community. During her time with us, she played an important role in projects, grant writing, financial forecast, fundraisers, volunteer, developing programs for at-risk youth, and transitioning individuals from rehab programs, in addition to organizing volunteer projects. Nita not only cared, she put action into their concerns-and that is what made the difference. She recently helped a homeless man and his dog to find housing after many ignored his cry for help. I’ll call him Jeff. Jeff was living in an abandoned house not fit for rats let alone humans. Nita spent countless hours transporting Jeff around the city to find housing, getting proper documentation, taking him to meetings to ensure housing was secured. Nita was able to restore his hope for an opportunity to feel safe, with a renewed confidence in himself as a human being and able to see a way out of the cycle of his despair. Nita has truly made a difference in many lives but especially in Jeff and his dog.